Pinetop, Arizona is the setting for Whispering Pines Resort featuring one, two and three bedroom cabins. You can also make the getaway at Whispering Pines Resort even more special with one of our private spa cabins lodges. Your weekend getaway or vacation to Arizona’s White Mountains should be a special time. Accommodations at Whispering Pines Resort will provide you with that 'special' lodging. 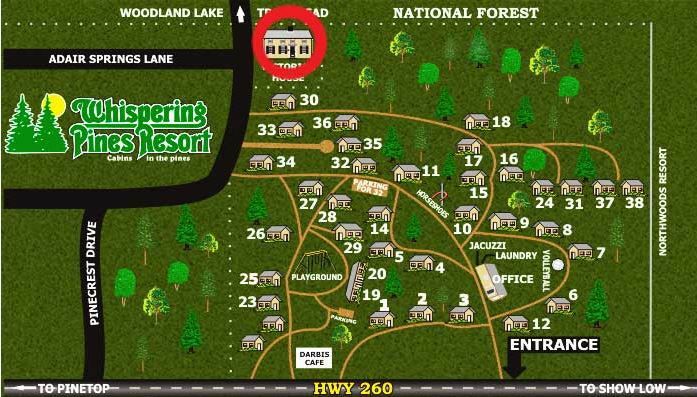 Whispering Pines Resort cabins are located on 13 acres, heavily treed with Pines and Oaks. The cabins are nestled amongst the Pines with the resort adjoining National Forest Service Land and the Woodland Lake Trail System. Take in a cozy hike or bike on the adjoining trails to Woodland Lake or Walnut Creek. Whispering Pines Resort is conveniently located in Pinetop, Arizona – just 12 miles from Show Low and only 26 miles from Sunrise Park Ski Resort. An easy and beautiful 3 hour drive from Phoenix and 4 hour drive from Tucson, it’s the perfect location for a weekend getaway or exciting vacation. Whispering Pines Resort enjoys the four distinct seasons, each one bringing different and exciting outdoor activities. Whispering Pines Resort is also a great location for day trips to the Petrified Forest, Painted Desert, Fort Apache or Casa Malapias to name a few. So whether its fishing, hiking, golfing, bird watching, horseback riding, or our cool temperatures in the spring, summer or fall to the excitement of skiing, boarding, or sledding in the winter, to the beautiful color change of the September and October, Whispering Pines Resort gives you the perfect setting to come back to rest and relax. All cabins are furnished, carpeted, and stocked with firewood - some units even have spa tubs! Whispering Pines Resort community areas include a playground, laundry, spa and other features. After a satisfying day exploring the White Mountains, curl up and listen to the whispering pines while basking in the warmth of a fireplace in your special lodging.